"Machine Gun Kelly," Al Capone, the "Birdman" — Alcatraz prison has had some infamous residents. Now, the prison is host to 1,300 solar panels, powering lights and appliances that for three-quarters of a century were powered by diesel fuel ferried across the bay. The panels are part of an effort by the National Park Service (NPS) and the U.S. Department of Energy's (DOE) National Renewable Energy Laboratory (NREL) to bring clean energy to national parks and landmarks. 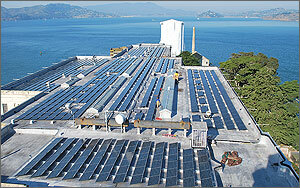 A 307-kilowatt photovoltaic (PV) array sits on the roof of the main Cellhouse building, attached to two 2,000-amp-hour battery strings and an inverter plant. The new 1,300-panel system produces close to 400,000 kilowatt-hours of electricity a year, reducing carbon dioxide (CO2) emissions by about 337,000 kilograms a year and reducing the time the generator runs from 100% to 40%. The NPS also made some energy efficiency changes, such as better light bulbs and changes in operation to reduce energy consumption. A massive solar battery system helps power the island when the sun doesn't shine — and it, too, is hidden from the view of the 1.4 million visitors the island and prison get each year. The $3.6 million project was funded by the American Reinvestment and Recovery Act.... The cost of transporting diesel fuel to the island (maintenance costs and the price of the fuel itself) boosted the cost of electricity for the island to about 76 cents a kilowatt-hour, said Andy Walker, a senior engineer and task leader for design assistance in the DOE Federal Energy Management Program (FEMP) at NREL. The PV project brings that cost to 71 cents a kilowatt-hour, and that includes the capital costs of buying the solar panels and erecting them on roofs.